My husband and I are lucky enough to be able to go to Paris for 6 weeks with our son. We will be leaving soon and being the list-maker that I am, I have already started mentally packing. I want to travel as light as possible. First, because I want to have room in my suitcases to accommodate a possible european shopping spree (or ten); second because we are traveling with a baby and I want to make sure that his needs are covered first. 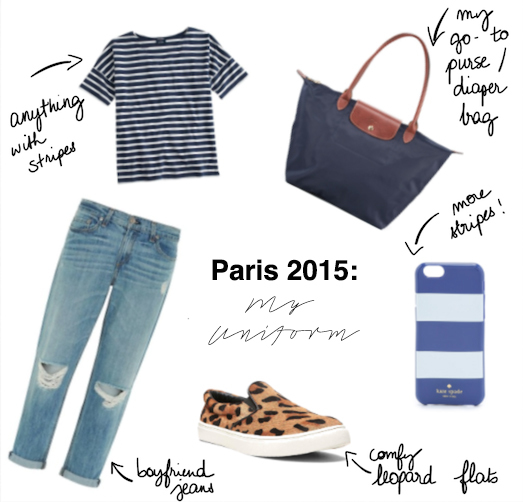 I put together a little moodboard of sorts with what is pretty much going to be my uniform when I'm in Paris. Let's be honest, it is already my uniform 90% of the time. But I do feel I don't need much more than that. Ha! Are you into nautical inspired fashion? Yes I am!! Perfect selection! Can't wait to see you honey!